I shall review the amendments before you in their order in the Resolution and then comment on some general issues that arise from the review or have arisen in public discussion of the Meech Lake Accord. With Section 2 as with all the proposed amendments the Legislative Assembly must ask itself what the legal effect of the language wi1l be. It must intend some legal effect by the language and be satisfied that interpreted under the principles of statutory and constitutional interpretation applied by the courts it will have that effect. The language of the proposed Section 2 is so general, evasive and unprecedented that we can only speculate what its legal effect may be over the long term. Passed into our fundamental law it amounts to a blank cheque to the courts to tell Parliament and the legislatures what they must and must not do beyond the specific language provisions of the Constitution Act about "the recognition that the existence of French-speaking Canadians, centred in Quebec but also present elsewhere in Canada, and English speaking Canadians, concentrated outside Quebec but also present in Quebec constitutes a fundamental characteristic of Canada; and the recognition that Quebec constitutes within Canada a distinct society." Any effect of Section 2 on the Charter is only a small part of its importance. The Charter itself is so obscure that it would be wrong to worry that Section 2 will weaken it. Under Section 2 the whole field of relations between French and English Canada, the perennial theme of our history since the 16th century, is made subject to judicial review. Not only the errors but the omissions of Parliament and the legislatures under whatever theory of these matters may appeal to judges in generations to come will be subject to their orders. The "affirmation" of the "roles" of Parliament and the legislatures in subsections (2) and (3) is vague and evasive. Role is not a legal term. Parliament and the legislatures have powers, rights, privileges and jurisdictions at law. The failure to specify which they have with respect to the "fundamental characteristic" and the "distinct society" leaves open the question of what if anything they are to do about them. Canadians in Quebec may no longer be a fundamental characteristic of Canada. What are Parliament and the legislatures to do about it? If, as is the case despite de facto or de jure official bilingualism in Ontario and the other provinces with a significant population of French speaking Canadians, French speaking Canadians continue to assimilate, what are Parliament and the legislatures to do about that? The "fundamental characteristic" is to be preserved but Quebec's distinctness is to be promoted. Quebec's role in preserving the "fundamental characteristic" already conflicts with its role in promoting its distinctness. The cross party consensus in Quebec is in favour of promoting its distinctness and preserving its Frenchness by unilingualism. Unilingualism must tend to reduce the English presence in Quebec and thus detract from this aspect of the "fundamental characteristic". A constitution, particularly one as difficult to amend as Canada's now is and may soon be, is not made for the near term. The evolution of the French and English speaking communities in Quebec and the rest of Canada over the medium to long term is unpredictable and judgements on what should be done about it will evolve if anything more radically and more unpredictably. Whether the proposed section 2 is to be read as futilely insisting on the preservation of the exact status quo, the exact proportions of English speaking and French speaking Canadians across the country, or as only vaguely setting a direction, it will operate as the subjection of the Parliament and the legislatures to the general and indefinite supervision of the courts in place of the democratic resolution of such issues as may arise. The legal effect of this section must be to pass power from Parliament and the legislatures to the courts. It assures no specific outcome and may lead to dangerous conflicts between the courts and our democratic institutions. The power to strike down democratically approved laws given to the courts by the Charter can be unsatisfactory. Whatever one thinks of the Morgantaler decision it cannot be satisfactory that it results in a legal vacuum until Parliament passes legislation consistent with it. It is a dangerous extension of the power of the courts to commission them to require Parliament or the legislatures to adopt laws in fulfillment of their "roles" under Section 2. Unless it is entirely meaningless that is what Section 2 does. A bicameral parliament works only where the upper house will only rarely reject or substantially amend measures passed in the lower house. The government with the confidence of the majority of the House of Commons must be able to pass any important legislation it considers advisable. This is fundamental to responsible government in the United Kingdom, Canada and the democratic Commonwealth. If the devolving of the power to nominate senators to the provincial governments is to amount to anything more than sharing out patronage plums it wi11 1ead to senators attempting to interfere with the national government's legislative programme in the political interests of the provincial governments that nominated them. This will weaken the national government. which must be free to act within its jurisdiction under the Constitution Act without provincial interference. It dangerously increases the possibility of a deadlock between the House of Commons and the Senate. The limited power to overcome a deadlock by the appointment of extra senators under s.26 will be seriously diluted by provincial leverage through the power of nomination. Quite apart from the injury provincial nominations will do to parliament the wording of the proposed Section 25 is objectionable. "Government of the province" is an informal political phrase. Executive power in the provinces is vested in the Lieutenant Governors and it is they who should make any nominations. Naturally they will do so on the advice of ministers responsible to the legislatures. Further it is the Governor General who appoints senators and it is to her that names should be submitted. There should be no reference to the Queen's Privy Council. How is it to signify who is acceptable? Will it meet and vote? The provision should simply say that the Governor General shall not appoint anyone to the Senate whose name has not been submitted by the Lieutenant Governor of the province. She will not have to appoint each person whose name has been submitted and in deciding whether to appoint a senator will, of course, act on the advice of ministers responsible to Parliament. The requirement that senators only be appointed from persons whose names have been submitted by the provincial governments will lead to friction and impasses over appointments. In most cases no doubt appointments will be worked out to the rough satisfaction of the provincial end national governments. But that cannot always happen as governments with conflicting political wills play a game of chicken, with a provincial government threatening ever more unacceptable nominees and the national government a prolonged vacancy. Relations between the national and provincial governments will be poisoned and Senate appointments will become a form of low comedy. As the courts become more free spirited in the interpretation of the Constitution Act, encouraged by its open language, they may become dangerously involved in attempts to break impasses over appointments to the Senate. Nothing in the Constitution Act as it stands prevents Parliament from passing legislation to accommodate provincial wishes on immigration. The effect of the proposed Sections 95A-E is to entrench in the Constitution Act agreements between the national government and a provincial government on immigration. They enable the national government to bind future Parliaments indefinitely to an agreement with a provincial government on immigration by simple majority resolutions of the House of Commons and Senate. They will result in a damaging reduction of a basic power and responsibility of a national government. As admission to any province is admission to the whole of Canada immigration is essentially a national concern in which the national government has always had paramountcy since 1867. The provinces have historically played a role only in recruiting and settling immigrants, a role now largely obsolete. Subsection 95B(2) may be sufficient to protect the national interest in immigration and at best may make the whole of Sections 95A-E meaningless. But again it is a blank cheque to the courts to prescribe the role of our national government in a basic field of national concern. Section 95 should not refer to the "Government of Canada" and "the government of any province" as these are political and not legal phrases. What will be legally effective under these proposed sections are the resolutions of the Senate and House of Commons and the Legislative Assembly of the province and the Governor General’s proclamation. Legislation, and particularly constitutional legislation, should not refer the political preliminaries that lead to any legal action. It is unnecessary and can lead to unintended legal consequences. The entrenchment of the Supreme Court of Canada will make the organization of final courts of appeal in Canada inflexible and subject to political constitutional negotiation. Already before the Constitution Act 1982 the Supreme Court of Canada was severely burdened. Section l0lA will make expansion or division of the court practically speaking impossible. The requirement that appointments to the Supreme Court of Canada be made from nominees submitted by the government of Quebec for the three civil law seats or the other provincial governments for the rest implies that and is based on the presumption that the judges have represented and will represent the interests of the government that nominates them. This is a fundamental attack on the independence and freedom from bias of the judiciary. There have never been any grounds for this presumption. The entrenchment of provincial nominations to the Supreme Court of Canada gives constitutional sanction to the theory that its judges should serve the interests of the provincial governments and will damage the authority of the court. Friction and impasses over appointments, particularly from Quebec, are bound to occur and will acutely damage the court. As with Senate appointments it is possible that the Court will become involved in breaking impasses over appointments. Again references to provincial governments rather than Lieutenant Governors, to the Minister of Justice and to the Queen's Privy Council for Canada are wrong, and show that the drafters do not understand our constitution. Entrenchment together with the vastly increased constitutional responsibilities of the Court, practically all of whose time will likely be taken up in making final decisions on constitutional cases that have worked their way up to it or been directly referred to it, will result in the separation of the Court from the whole body of inferior courts whose work will remain a mix of "ordinary” cases at law on which they will generally have the last word and constitutional cases on which they will never have the last word. Its position as an almighty political court above the law will both corrupt it (vide Acton) and injure its authority. The entrenchment of the Supreme Court of Canada in the constitution is a particularly pure case of the craven emulation of American constitutional arrangements. As we imitate the United States we should note that respect for their Supreme Court has been greatly injured in recent years and wi1l likely continue to decline. It is already objectionable that Parliament is paying for national shared-cost programmes in areas of exclusive provincial jurisdiction under the Constitution Act. Where a national programme is desirable the provincial governments should give up jurisdiction and let taxing, spending and responsibility rest all together with the national government. If there are to be such programmes there is nothing to stop the national and some provincial governments agreeing on opting out and consequent financial arrangements. The proposed Section 106A will give the provincial governments an automatic no cost option of opting out and will require the courts to judge whether a province "carries on a program[sic] or initiative that is compatible with the “national objectives" and what "reasonable compensation" for the opting out province should be. The involvement of the courts in the detailed assessment of political programmes and financial trade offs between the levels of government is wholly unacceptable. In this proposed section the use of the political phrase "the Government of Canada" is particularly inept. The Government of Canada has no money except what Parliament votes it. It is Parliament that will have to provide such "reasonable compensation" as the courts decide and this bad provision, if it must pass, should say so. The emergence of so called "First Ministers" conferences in the last 25 years as a major feature of national politics has already injured our political culture and institutions. They have confused political responsibility, distracted governments at both levels from their work and seriously undermined the authority of the national government in its own jurisdiction. Such meetings if not banned outright ought to be rare and informal. To entrench them in the constitution is grotesque. The Prime Minister and the provincial premiers are simply primus inter pares ministers running committees of ministers responsible to their respective Parliament and legislatures. Their place in the simple but strong and profoundly good constitutional institutions developed in Britain and the Commonwealth in the last three hundred years is entirely inconsistent with their appearance as great sovereign princes regularly meeting in solemn conclave to settle the nation's affairs. As has probably happened with the measures before you this corruption of our political culture and institutions has severely damaged the authority of Parliament and the legislatures by presenting them with what are effectively political fait accompli. There should be nothing for the "First Ministers" to meet about. If the division of powers between a national and provincial governments can be justified each should be able to carry on within its jurisdiction undisturbed by the other with their civil servants occasionally in touch to see that wires do not get crossed at the edges of their respective jurisdictions. This proposed section will encourage no cost opting out by provinces from transfers of jurisdiction. Canada needs a stronger national government and easy transfer of powers from the inflated provincial jurisdictions to the national government. This provision will make transfers more difficult. Again the courts are to decide what "reasonable compensation" would be. This decision will be particularly difficult for the courts. In the case of compensation for national programmes opted out of under the proposed Section 106A some measure of financial compensation will be available in the level of national spending on the programme opted out of. With a transfer of jurisdiction compensation will depend on what is done with the jurisdiction. The national government may choose to do little, using the jurisdiction to keep the field free of regulation and interventionist spending. The opting out province may keep the jurisdiction to do just the reverse. The courts will be faced with making impossible and politically charged judgements. The requirement of unanimous agreement on amendment of any aspect of the constitution puts the country in a constitutional straitjacket. The addition of matters to this section with the already too onerous requirements for other amendments in Sections 38 and 42 will give the provincial governments an iron hold on the national government every time constitutional change is necessary. The history of Meech Lake and human politics means that this will lead to bargaining in which the already over mighty provincial governments make demands on the national government in exchange for their consent to amendments. With such a prospect it may be better to regard the constitution as unamendable. The requirement of annual constitutional conferences will perpetuate the constitutional distractions of the last twenty years of Canadian politics. I set out above how objectionable “First Ministers" conferences are. It should be remembered that the conferences in 1864 that lead to Confederation were not of "First Ministers" but of delegates of the respective legislatures. They met of course not to take power for themselves out of a constitutional impasse but to give up power to a new government and to build a nation, not to carve it up. The whole course of the debates leading to Confederation should put to shame those who have participated in the squalid proceedings leading to the measures before you and who vainly and arrogantly claim to be new Fathers of Confederation. endless parade of lobbies to push not for the democratic redress of their legitimate grievances but the further encumbering of the constitution with vague, inflexible formulas to be interpreted by overburdened. irresponsible and politicized courts. Every amendment achieved will have to be bought at the cost of further weakening the national government. We need a moratorium on constitution making and time to get on with the real business of government and to let the full extent of the damage done in the last six years emerge. Meech Lake, we are told, was necessary to get Quebec to "join the constitution" or some equally meaningless phrase. There was no need to have Quebec "join the constitution". The Constitution Act has full and unchallenged legal effect without the support of a resolution of the National Assembly of Quebec. smile is alway too high as a smile paid for is worthless. And as always happens when Quebec makes demands, the other provinces cynically line up to take what they can get with no thought of the injury they do the nation. It is all for nothing. Who can suppose that when Quebec nationalism resurges again in ten or twenty years time, as it has again and again since 1759, we shall simply say "Meech Lake" and all will be well? Who can suppose that when tomorrow's separatists are threatening they will be daunted by the thought the their demands are subject to the veto of Prince Edward Island? Quebec can "join the constitution" and smile on us because it knows that whenever it calculates that Confederation or the threat of separation alone are no longer profitable it can go its own way, with a strong national government, already the strongest in Canada, and all the Constitution Acts in both official languages you could pass in a century if you gave your time to nothing else would not hold them up a minute. The Charter has greatly burdened the courts with difficult and dangerous political decisions. It can be argued that for the sake of fundamental rights and freedoms, whose history is tied in with the development of our law, this is satisfactory. It is another thing entirely to burden the courts further with the settlement of purely political issues: the supervision of relations between English and French Canada under Section 2, the possible settlement of disputes over Senate and Supreme Court appointments under Sections 25 and 10lB and C, the supervision of immigration policy under Sections 95A-E, the assessment of national programmes and objectives and compensation for opting out of them under Section 106A and the assessment of compensation for opting out of transfers of jurisdiction under Section 40. Courts are the wrong institutions for the settlement of such questions. Their involvement in them will politicize them. They cannot decide such questions efficiently. They are irresponsible. For their proper work that is as it should be. For political decisions it is unacceptable. The "notwithstanding" provisions of Section 33 of the Constitution Act 1982 limit the irresponsibility of the courts for the larger part of the Charter provisions. 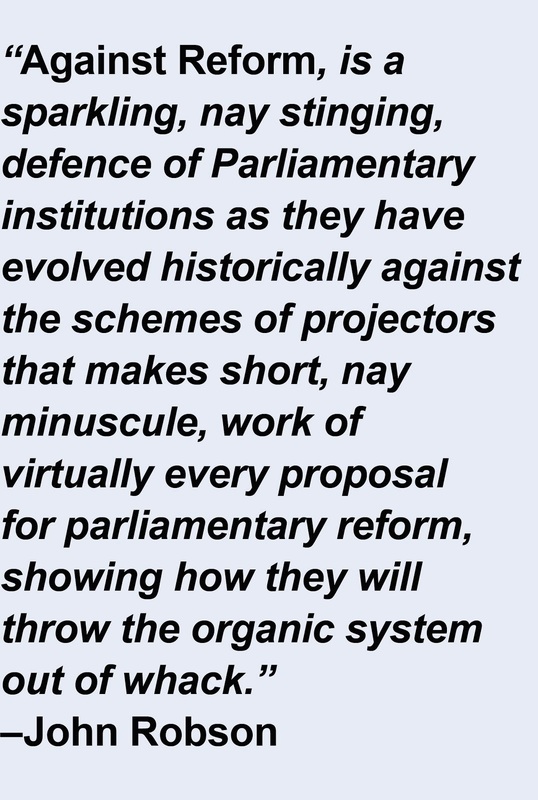 Those provisions were thought necessary in 1982 to preserve parliamentary sovereignty, which is fundamental to our democratic government. They do not and cannot apply to the dangerous political powers given the courts by Meech Lake. With amendment of the constitution near impossible the irresponsibility of the courts is nearly perfect. The provincial governments in Canada were established and continued as simple instruments of the public good easily adapted or put aside as circumstances required. Such was their history up to 1867. A hundred years of constitutional stability and the settling of political interests in the existing governments gave them a false appearance of permanence. The constitutional wrestling of the last 20 years has lead to the provincial governments becoming de facto sovereignties. They have consistently sought increased power without regard for the national interest from the politician's instinct to seek more power wherever he can most easily lay his hand on it. We can either trust ourselves from sea unto sea to run our public affairs together or we cannot. If we can, our democratically elected national parliament should be free to govern the whole country without provincial or judicial interference. If we cannot, the answer to our mistrust will not be to tie down and make impotent our national parliament, but to accept that we must separate. I do not believe Canadians want either outcome but as our constitution is remade by bargaining between ten provincial governments and a solitary national government to speak for the national interest they will get an impotent national government and finally the logical sequel in separation. 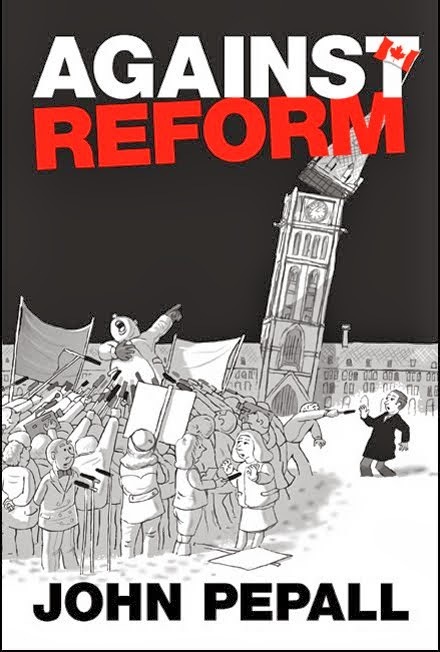 All the provincial governments have gone into this latest bout of constitution making looking for greater power at the expense of the national government under the cloud of "national unity" and “bringing in Quebec" rhetoric. It is a sad but not surprising show of human nature that this should be so. But it need not be so. Each of us, whether in provincial government or private citizens must judge the provisions of our constitution by whether they serve the interests of Canada as a whole. Ontario should be pushing for a stronger national government, offering to give up jurisdiction to Parliament and leading the other provinces to do the same. The resolution before you will gravely injure our country. I urge you to reject it. If you do not, the damage done may be irreversible and, in the long, run fatal.